Before talking about anything we have to talk about the wig. It’s a wig Nicole Kidman wears in “Destroyer” as Erin Bell, an L.A. detective who’s not so much burned out as down and out. The wig is hideous. It does not appear carefully situated atop her head so much as unceremoniously dropped there, truly accentuating her I-Was-Just-Sleeping-In-The-Car countenance. And the wig impeccably matches the scraggly makeup design, both of which turn Bell into something akin to The Walking Dead, accentuated by Kidman’s zombie-ish walk, where she genuinely seems to be dragging herself forward. 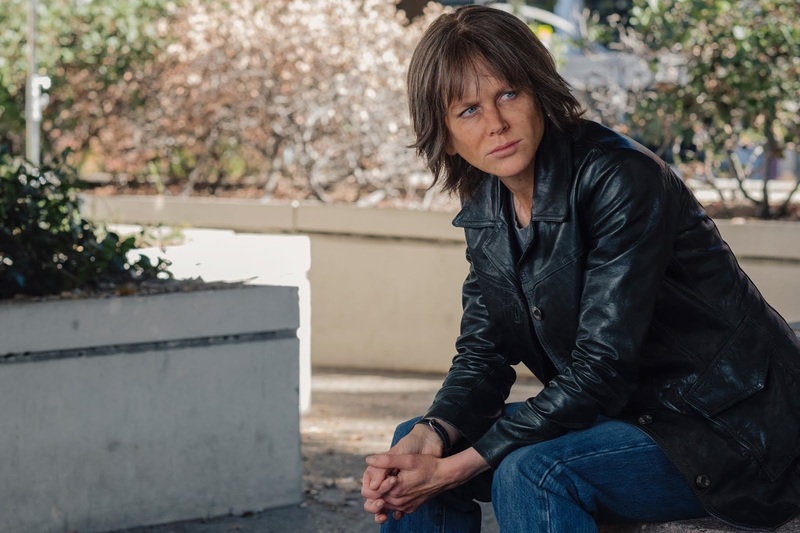 But “Destroyer” also makes room for flashbacks of Bell’s younger self which cleverly allows for Kidman to undergo two actorly transitions since her character is under deep cover and she has to go sort of heroine chic to blend in amidst bank robbing druggies. Actor vanity or not, Kidman is never asking to be liked. God, no, and neither is writer/director Karyn Kusama interested if you enjoy “Destroyer” in that popcorn munching kind of way. If many movies fail to manage tone, “Destroyer” does not, seeing its tone right through to the end – bleak, it is very, very bleak. Kusama elicits that bleak tone through atmosphere. If there are nighttime scenes, there are just as many set during the day, a noir trading shadows for the hot sun. And if Kidman’s makeup makes it seems as if her character’s skin is rotting then the sun only intensifies this sensation, leaving her wholly exposed, not just to those deadly solar rays but symbolically to her own sins. The living spaces we see are generally portrayed as either trashy or virtually uninhabitable, and the Los Angeles Kusama sees through the lens is less the sprawling cool city of Michael Mann than the small city in a large desert, as the late Roger Ebert deemed it, of “Chinatown.” The primo action sequence stretches not through downtown or across city streets in sleek cars but on foot through back alleys, all of which feel purposely un-populated, truly evincing the sense of L.A.’s vastness and making it seem as if this story is happening not at the heart of things but on the edge of the world. An earlier foot chase under cover of darkness concludes with Bell and the pursued out of breath and looking out over Dodger Stadium, a whole other world a whole world away. The story itself, however, which involves a nefarious dude from Bell’s past returning to wreck her present, leaves something to be desired. Though the flashbacks contend she gets in too deep, we never quite feel exactly why, as Bell’s falling for her fellow undercover operative (Sebastian Stan) is the one detail into which Kidman struggles to breathe life, making it come across as a mere plot point for multiple reasons, including a twist that might have meant more had their affair earned more credibility. Yet if this makes it seem as if Kusama’s jumping back and forth between present and past is intended to cover up for the rote narrative, it also literalizes the idea of Erin plunging into her own past, given great weight by triggering flashbacks with mammoth close-ups of Erin, as if she is really going back to those places in her mind where she made one wrong decision and now is obligated to pay for with the rest of her life. In the end, “Destroyer” is not a procedural so much as penance. 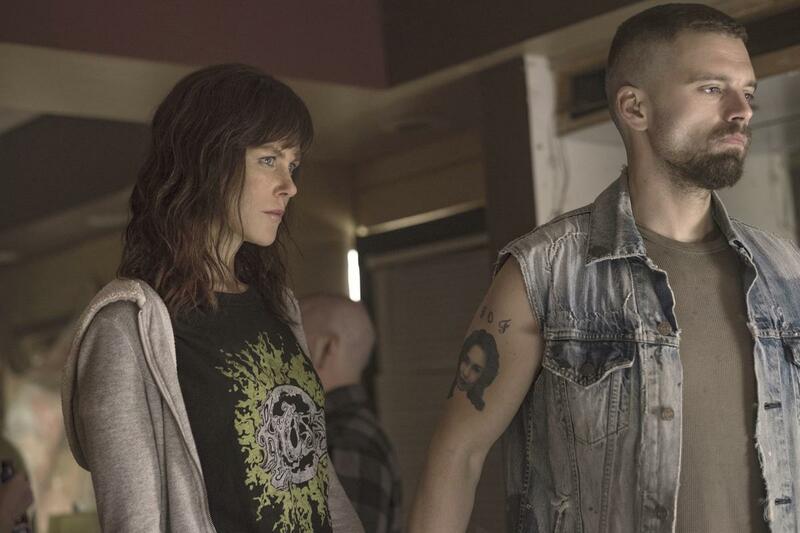 Bell is no supercop, constantly getting the crap kicked out of her, and the relationship with her daughter, involved with an insufferable boyfriend, is played like something she is made to suffer. Even the climactic confrontation is intentionally doused of its traditional impact. In another movie, the conclusion’s nigh mysticism might have suggested redemption; here it just suggests wishful thinking.